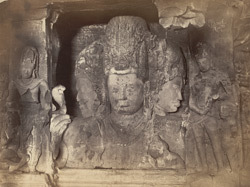 Photograph of the Trimurti sculpture of Shiva in the cave temple of Elephanta, in Maharashtra, taken by D.H. Sykes around 1871, in the illustrated book 'The Rock-Temples of Elephanta or Gharapuri'. The temple was probably commissioned by the Kalachuri dynasty in the 6th century. James Burgess wrote, ''The most striking of the sculptures is the famous colossal three-faced bust, at the back of the cave, facing the entrance...It occupies a recess ten and a half feet deep - exclusive of the pilasters in front which is about two and a half feet...". The left profile expresses the god's feminine and peaceful aspect which contrast with the fierce and masculine right profile. The majestic central face is calm and detached. The three faces symbolise the nature of the Divine, which combines and trascends all opposites.